Just south of the U.S.-Mexico border is a political leader who stands up for his people unapologetically and does not back down in the face of criticism. 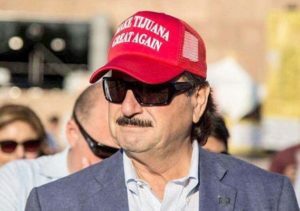 He is Juan Manuel Gastélum, mayor of Tijuana, and he has become known locally as the “Trump of Tijuana,” a nickname he wears proudly. He has also been known to wear proudly a hat sporting the slogan “Make Tijuana Great Again,” reminiscent of the national leader to the north. Gastélum’s choice of headwear and his accompanying plain-spoken comments about Central American migrants have earned him plenty of criticism from national leaders but also growing support locally from Tijuana citizens disturbed by what the migrants are doing to their city. Gastélum has publicly referred to the migrant caravans arriving in Tijuana as an “avalanche” and a “tsunami,” stretching the city’s resources paper thin and threatening the livelihood of thousands of citizens should the U.S. close the border crossing. He has also raised the ire of his critics by charging that the Central Americans are bringing crime and disease to Tijuana, which he is committed to making a great city. “I’m not going to compromise Tijuana’s economic resources to fulfill a wish of the federal government to try to show themselves as very humanitarian,” he has declared. Mexico’s federal court has issued an order to the mayor not to make derogatory remarks about Central Americans. Gastélum has appealed.